One time, if we wanna go to some place and it’s should be move almost all family also our live animal (pets), how can we do? How regulation or mechanism should be prepare and fixed? IATA’s Live Animal Regulations (LAR) is the global standard and the essential guide to transporting animals by air in a safe, human and cost effective manner by commercial airlines. Whether it is a pet, an animal transported for zoological or agricultural purpose or for any other reason, the objective of the LAR is to ensure all animals are transported safety and humanely by air shipment. In today’s,Animal have been transported with modern mechanism, carriage of live animals by air is considered the most humane and expedient method of transportation over long distances. The international air transportation (IATA) ensure that both safety and animal welfare are addressed in all regulatory issues parting to transportation of live animals by air. Whether you are shipper, a freight forwarder, an airline, a passenger traveling with pets or an animal care professional, the LAR is your guide for transporting animal humanely and in compliance with airline regulations and animal welfare standards. In conjunction to the above, here is useful information when you plan transport or traveled with pets or a live animals? As a shipper or owner, you also have a responsibility to take the necessary precautions to ensure the well being of the animal you ship. Here are several of the more important requirements. It is important to train your animal to its new surrounding. Let it become familiar with the crate or kennel a few weeks or months before you planned departure. Animals behave perfectly fine when accustomed to the kennel or crate they are transported in. Should you decide to build your own wooden crate, verify with the airline if they accept custom build containers. Cages and other shipping containers must meet the minimum standard for size, ventilation, strength, sanitation, and design for sale handling. (Sky kennels furnished by the airlines meet these requirement). 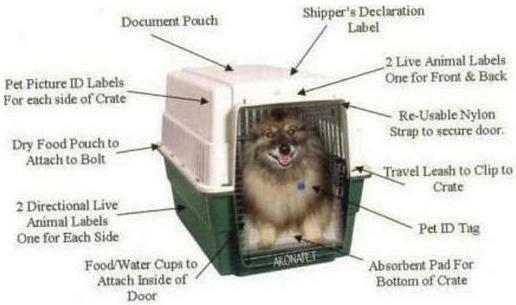 For certain dogs, airlines may mandate the use containers of a different more sturdy design than those of Container Requirement 1 (CR1). It is equally important to ensure that all locking mechanisms function properly and that the animal cannot distort, gnaw at or pushing/out the wire mesh of the door. So, the mest must be firmly attached to the door, not stapled. Most airlines require a health certificate, for any animal they are transporting, whether in the cabin or as an unaccompanied shipment. So, it’s good idea to have a licensed veterinarian examine animals within ten days prior to shipment and issues a certificate stating that the animal is in a good health. Airline may not require health certificates for service animals used by passengers with disabilities. Only small dogs and cats go in the cabin. Some airlines may not even allow them in, and will transport them as special baggage in a heated and ventilated hold. Don’t worry, cats and dogs actually travel better this way, because it is quieter and they will rest in a darkened environment. Contact the airlines you have selected to confirm that they accept your pet on the day and flight that you prefer. Some airline restrict the number of animal on a flight so the more advance notice you give them the better it is. Find out how soon before the flight you have to check in, pet become stressed with the entire bustle at an airport, so keep it to a minimum. If your pet is allowed in the cabin, check in as late as possible. If it’s going in the hold, check in early so that in can go to the baggage area and be put somewhere quite and dimly lit in order to relax. To prepare your pet, reduce the quantity of food the day before but give it enough water. Don’t give your pet solid food in six hour prior to the flight, take your dog for a walk before leaving for the airport and again before check-in. A light meal two hour before tendering the animal to the carrier will help to calm it. If you ship your pet as air freight, check with the airline to ensure their freight facility is open so your pet may be claimed by the consignee. Be sure to reserve a space for your pet in advance, and inquire about time and location for drop-off and pick-up. Try to schedule a non-stop flight, avoid connection and the heavy traffic of a holiday or weekend flight. Note that, it is preferable to ship your pet on week days as all staff is working and liaison is easier all along the route. Write your name, address and phone number on the kennel, and make sure your pet is wearing a tag with the same information. Consider purchasing a temporary tag showing your destination address and phone number. If possible, bring a photo of your pet, in case it is lost (just kidding) but it’s possible you do.